Susan G. Komen Greater Atlanta raised over $1 million at the annual Race for the Cure to support its mission to enable our community to detect and survive breast cancer by facilitating access to quality care, providing education and supporting research. At this year’s event, Komen Atlanta also announced the grants awarded to 18 local healthcare organizations, highlighting the impact of the funds raised by Race for the Cure participants, sponsors and donors. Komen Atlanta has awarded more than $29 million in grants to local Metro Atlanta healthcare organizations since 1991. 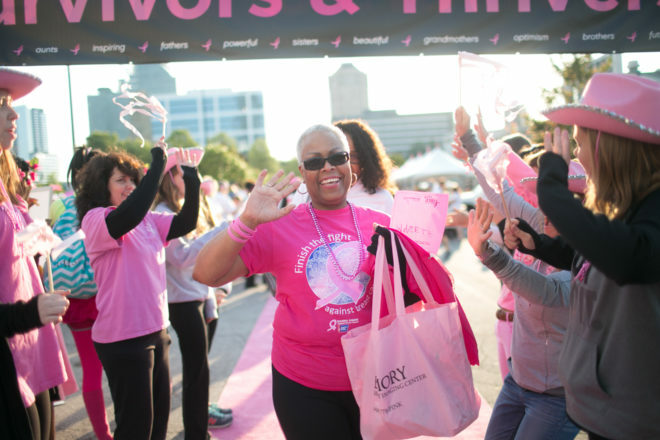 This year, Komen Atlanta’s expanded grant program prioritizes programs that reach Metro Atlanta’s high-risk and high-need communities, particularly African-American, Latina, recent immigrant and LGBTQ populations. These 18 Metro Atlanta healthcare organizations will share $1.63 million in grants to address gaps and barriers to accessing breast health services and enable our community to detect and survive breast cancer.